Argentina to protest Falklands' (Malvinas) oil activities and invites UN C24 president to Buenos Aires. Argentina will file an official complaint against Britain for oil exploration activities in Falklands/Malvinas disputed waters before the United Nations Decolonisation Committee and have invited the C24 president to visit Argentina to hold a meeting on the issue in Buenos Aires. According to Argentine official media the recent announcements of oil discovery in the Falklands/Malvinas waters and further confirmation of potentially vast reserves violate the UN Decolonization resolutions, reignite the conflict, although Argentine sources believe there is much of ‘financial speculation’ involved in the announcements. 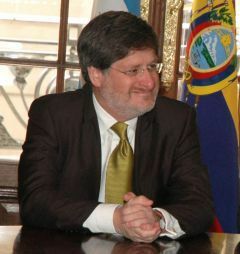 “In coming days the Argentine Foreign Affairs ministry will again accuse the British government of violating UN resolutions following exploration activities undertaken by the British companies Rockhopper Exploration and Desire Petroleum among others in the exclusion zone, the area under litigation in the sovereignty dispute over the Islands”, an official source is quoted. However the Argentine Foreign office doubts the commercial viability of such wells and describes the situation as “stocks speculation”. Nevertheless Argentina will again file a complaint before the C-24 which is currently under the presidency of Ecuadorean diplomat Francisco Carrión Mena. “Last Tuesday Foreign Affairs minister Hector Timerman sent a personal invitation to the C24 president to hold talks in Buenos Aires”. Last week Rockhopper announced the commercial viability of the discovered oil prospect which was confirmed by appraisal drillings “making shares soar almost 40% in one day precisely in the week of black Monday for world markets and which remain highly volatile” point out the Argentine sources. In the sovereignty dispute Argentina counts with the support from MERCOSUR and UNASUR whose members agreed not to supply in their ports vessels that might be linked to hydrocarbons exploration activities in Falklands/Malvinas waters. Besides the region, Argentina’s position is also supported by African and Asian countries, the source is quoted. The UK can only speculate with “the implicit support from the European Union that has included the Malvinas Islands in a list of British Overseas Territories”.